Marc Jacobs’ perfumes for women have been quite famous for a long time, especially since the release of Marc Jacobs Daisy which delivered a massive success on the market some time ago. However, there are now various new products coming into the competition. The company knows that they need to come out with a successor to Marc Jacob Daisy. Hence, Marc Jacobs Dot was made. 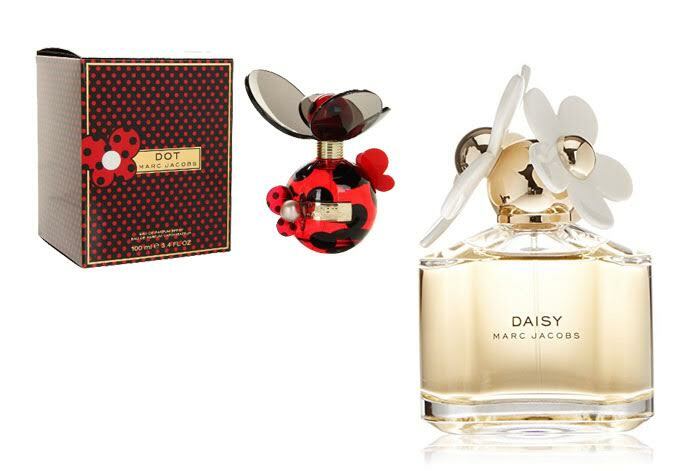 So, how does Marc Jacobs Dot compare to Marc Jacobs Daisy? Which one is the best for you? Let’s find out below! Marc Jacobs Daisy is an award-winning fragrance that has been very popular among women since a long time ago. Marc Jacobs Daisy is well-known for its excellent freshness and feminine notes. Coming in a clear, translucent bottle that is topped with daisy pods on the cap, Marc Jacobs Daisy does not only smell great, but also features a premium, elegant-looking packaging as well. Onto the fragrance itself, Marc Jacobs Daisy is crafted with top notes of wild strawberry, velvety violet petals, gardenia, and jasmine. They create such a fresh and somehow sweet initial scent. They then transform into the base notes of birch and cedarwood, which add some intensity as well as prolonged novelty. On the other hand, Marc Jacobs Dot comes in a circular bottle that certainly remains you of a ladybug. The bottle is colored predominantly in red, but with black dots, pretty much the appearance of a ladybug. The packaging does a good job in representing the scent of Marc Jacobs Dot: cheerful, fun, yet with elegance. Marc Jacobs Dot Dot is somehow similar to Marc Jacobs Daisy, but there are some distinctions. It is fruitier and sweeter, initially, but it quickly turns to be more laid back. It also features the top notes of red berries and mid tones of jasmine, but the base notes are based on driftwood. The combination creates an effervescent floral opening which quite quickly calms into a tame, subtle, and sweet atmosphere. While Marc Jacobs Daisy is quite a bold perfume that is appealing to a wide range of ages and tastes, Marc Jacobs Dot is more suitable for the youthful people. Marc Jacobs Dot is not exactly a very memorable scent, but, hence, it becomes very versatile and easy to wear.